It’s Monday morning, around seven-thirty. Our black Lab, Chubby, has just finished eating, and now she wants to go outside. 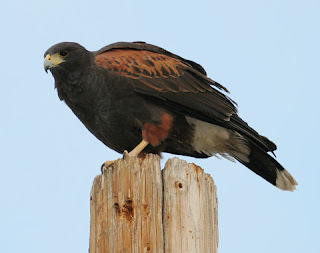 I open the door to the back yard, and as the dog and I step out into a frigid pre-dawn gray, we are greeted by a beautiful, dark-brown Harris hawk swooping beneath the telephone wires and directly above our heads, screeching hoarsely as it passes over the house. I think I’ve seen this hawk before. There have been several times over the past month when I’ve seen a Harris hawk prowling the afternoon skies of our neighborhood, strategically maneuvering from one palm tree to another. 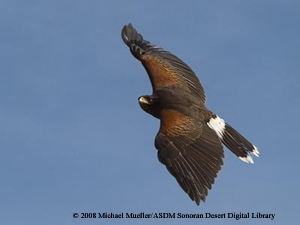 Harris hawks are distinctively colored compared to other types of desert hawks: their bodies range from rich red-brown to chocolate, darkening almost to black. They are white at the base of their tails, but the tail feathers themselves are black, or nearly so, with a thin white fringe at the end. Their bare legs, talons, and beak are a buttery yellow-gold. Seeing a hawk this early in the morning was unexpected enough. To hear its shrill cry at close range, though, was enough to make the blood jump inside my body. Maybe it was as surprised to see us as we were to see it. Whatever the reason, the screech had in it that compelling, primal quality that startles even as it unlocks your memory. I immediately rushed out into the yard and looked back over the house, but it had been flying low, and was already gone. I don’t know exactly what it is, but whenever I see a bird of prey, I will stop whatever I’m doing to watch it. Call it feather envy, or something, but I am naturally drawn to the sight of a raptor, from the smallest kestrel to the largest eagle. Once I’ve spotted one, I will follow it until the magnetic bond is broken only by its disappearance from my field of vision. This has resulted in many precarious moments while driving, especially for Elizabeth, who will catch me suddenly twisting my head sideways over the steering wheel to look up through the windshield at a bird, while the car continues to barrel down the road in what may or may not be a straight line. I think part of the reason I get so entranced around predatory birds is because I was raised in the suburbs, where nature is embraced only to the extent that it can be fully controlled. Intrusions by purely wild animals of any sort were rare, and for that reason, I tended to treat their infrequent and haphazard appearances as precious occasions to be absorbed, and not to be wasted. Somehow, at age 43, I guess I still do. I pondered over the magnificence of our timing that morning while Chubby, completely disinterested, eagerly went about her own business. Not more than two minutes later, however, the hawk returned. It rose up from beyond our tangerine trees and landed on a telephone pole standing in the alley just outside our back wall. It began to poke at its feet, or so I thought, until I realized from the small poofs of feathers it was tossing from its beak that it had caught another bird. I watched, glued to the spot, as the raptor’s beak worked like practiced fingers, pinching the feathers and pulling them out with one sharp jerk, and then flicking its head to throw the feathers away. After several feather-plucking stabs it would pull a strip of meat off, and swallow it with a quick bob. I watched with fascination as it repeated this process over and over. You know, I thought, this is exactly the sort of thing that makes untamed nature unwelcome in the suburbs. No one wants to be reminded of the cruelty and brutality of the natural world first thing in the morning. We want to be allowed to start the day peacefully, tranquilly. We want to breakfast on the hope that this day will be kind and gentle to us. We want to look outside and see a world that embraces our existence, that reflects benevolence, not the eternal struggle for survival. But after all, it’s a hawk. It’s just doing what hawks do. It has to feed itself, the same way its prey feed on seeds, and berries, and bugs. The hawk is a part of creation, and so must be here by God’s will as surely as the sparrow. Granted, my circle-of-life attitude would have been vastly different if that had been my Chihuahua getting plucked up on the makeshift dinner table at the top of the telephone pole. And I do love birds, all birds. But there are many birds. There are very few hawks, especially this far into the city. I lingered to watch as the brown hawk devoured its breakfast. I wondered how long it took to eat a bird from start to finish. I wondered if hawks coughed up the bones and extra feathers after they finished, like an owl does. I wondered if raptors got tummy aches if they ate too fast, or if, as fledglings, they were discouraged by their parents from flying for a half-hour after eating. Unfortunately, I had to leave all the mounting questions unanswered. It’s my job to drive Jessica to school, and it was time to leave. Even as we backed out of the driveway, I could still see the predator perched atop the pole, working away at its meal in the growing daylight. I was only gone for twenty minutes, but by the time I returned, the hawk was gone from the morning. My mind quickly settled back into normalcy, once untamed nature had vacated the premises.